Lilo was born and raised in Bogota, Colombia; she is the youngest of four kids (two brothers and one sister). From kindergarten through high school she attended a Catholic school run by Benedictine Nuns. Her mom’s strong Catholic faith combined with the teachings of the Nuns at school left in her a deep interest in learning more and more about the meaning of life and a continued search for what she is here for. These questions started to get an answered later when she met Father Humberto, a diocesan Priest in Bogota who founded a Theology School for the laity where she studied for four years. These studies and her closeness to Father Humberto have accompanied Lilo throughout her life to continue deepening in her faith and knowledge of the Catholic teachings. She is married to Jairo and has two boys, Juan Diego and Andrés. In 2005 they made the hard decision to move to Canada looking for better opportunities and a safer place to raise their kids. Being a newcomer was a big challenge for her. Once they got to Calgary she enrolled in Mount Royal to obtain her Petroleum Land Administration Certificate and later that same year was offered to work in an oil and gas company and she is grateful to successfully continue to be working in the industry. She has been defined by her colleagues and supervisor as a hard working, joyful and dedicated employee. From the time she was a teenager, Lilo has always been active in her parish as Lector and Choir member. 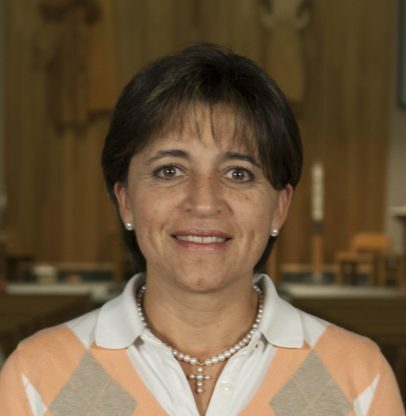 After many years of being a dedicated wife, mom and worker, and now that the boys are older, Lilo has feels an immense need to serve again and share the knowledge and life expertise acquired during her Theology studies and she takes seriously the call to the New Evangelization.